Citadel Spirit Hosts – Completed! + LotR Barrow-Wights. | Azazel's Bitz Box. Citadel Spirit Hosts – Completed! + LotR Barrow-Wights. So, the following day from starting these nice little surprises in the post, I managed to finish them. As stated last time, it’s a quick and simple job, but it’s effective enough and they look good on the table. 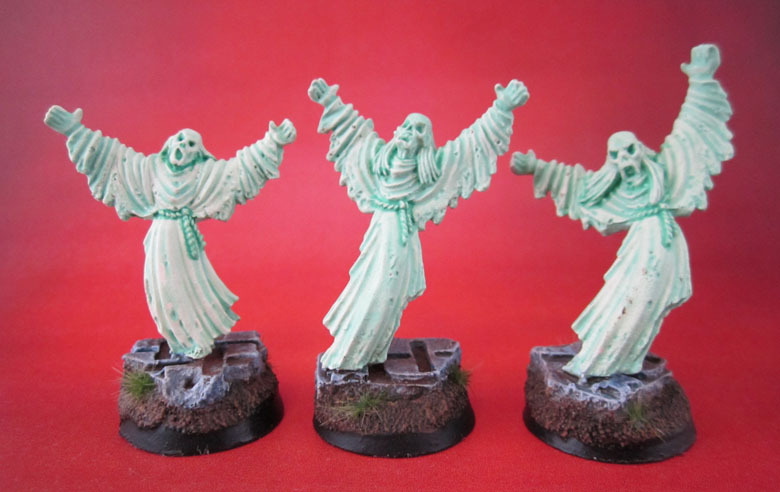 Citadel Spirit Hosts – Based as a unit of Wraiths for Kings of War. 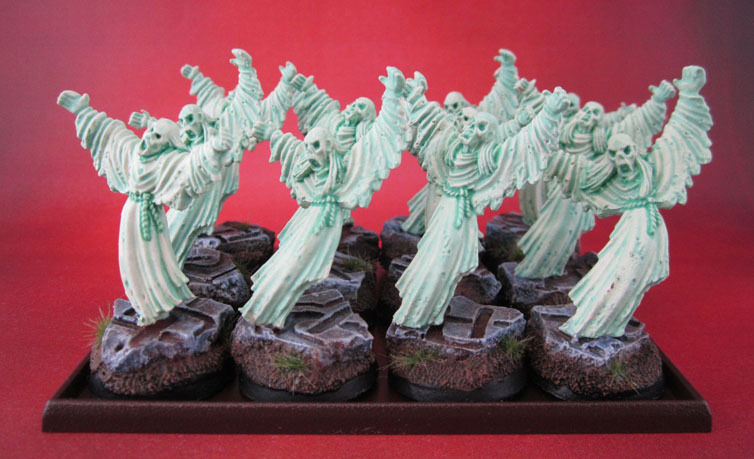 It seems that these figures are properly called “Spirit Hosts”, and appear to date from 2000 when GW split the undead army into “Wet” (Vampire Counts) and “Dry” (Tomb Kings), as that’s the first reference I can find to them over at Stuff of Legends. They usually mount three to a 40mm base, but I’m using them for Kings of War, so individual 25mm round bases does it for me to turn them into a regiment of Wraiths. From the last post where I talked about the paint process, I simply painted the bases (base, drybrush, wash, weathering powders) and added a thinned down Citadel Sybarite Green paint wash to the eyes, nostrils, mouths, and around the belts and necks/hair of the individual ghosts to emphasis those parts slightly. And of course, a nice matt varnish to finish them off. – And yes, that is a spot of weathering powder on that front guy in the photo. Sorted now! Some might be critical that I’m using what now seems to be the “official GW palette” for ethereal models, but I liked the effect when they were used on the Army of the Dead figures more than a decade ago, and to me the look really is suitable for undead, and looks better than the “dirty sheet” look that was used before. Citadel Spirit hosts bases as Individuals for skirmish games. While I do like the look of the new ones, these ones were free, painted in a day, won’t snap off their bases if you look at them funny, and are a lot more versatile – at least when based individually. While I was photographing these guys, I thought I’d also take a pic of my Citadel Lord of the Rings Barrow-Wights. These two (and their third – a former Army of the Dead figure) are used both as actual Barrow-Wights in LotR SBG, and also as a troop of Wights (surprise!) in Marouda’s Kings of War Undead army. Well, she hasn’t used them yet, but soon. I’ve shown these on the blog before, but that was some time ago, and the pictures there aren’t exactly the best, so why not show them again in a slightly better light? Why not indeed. 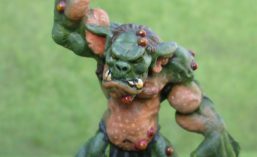 This entry was posted in Age of Sigmar, Fantasy Gaming, Kings of War, Lord of the Rings, Undead Army, Warhammer Fantasy - 9th Age and tagged Barrow-Wights, Citadel Spirit Hosts. Bookmark the permalink. They look great. There isnt anything “wrong” with using more modern approaches if they look better, which in my opinion the greenish ghost qualifies as. I try to pick and choose my models and techniques from my almost thirty years of hobbying, rather than whatever is chic or retro/post-chic. Oh nice! I may have to give those fellows a call. Now I just need to find a good Sam and Dean from Supernatural, and perhaps a couple of sets of Hasslefree figures that are L4D and I’ll have all I need to run quite a few players through a truly bizarro scenario. Im all in favour of nice big mashups with these things. My Paranormal Investigators are going to be part of an Ordo Malleus Inquistorial retinue. Both the barrow-Wights and Spirit Hosts turned out nicely. Both have that nice, spectral lustre, but my favourite are the Wights, mainly because of the contrasting colour of the armour pieces. 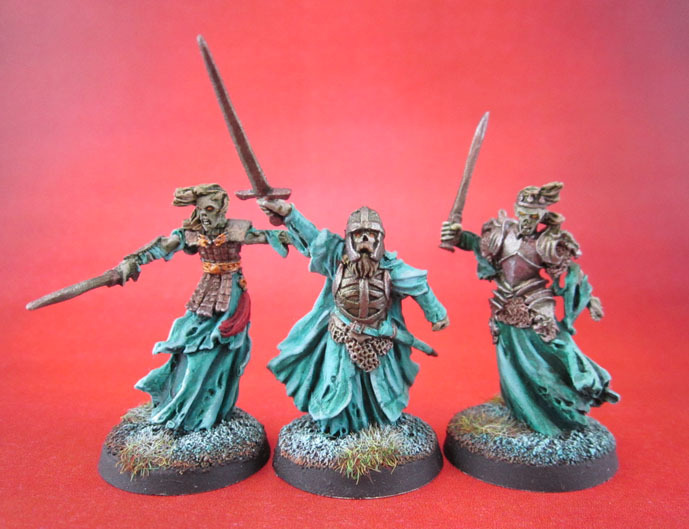 Pingback: Citadel Grave Guard – As Kings of War Wights (Neglected Model May ’18) | Azazel's Bitz Box.